The Friendly Toast in Cambridge is, to put it nicely, hit or miss with its food and service. Arrive before 9:30am and sit right down, but show up after 10 and you’ll wait an hour. Order a waffle and receive a tiny Eggo for $10, but get pancakes and you’ll eat for a month. Eggs in a nest? Too dry to be edible. A side of sausage? Delicious and perfectly cooked. Coffee is so so, but the almond tea is worth the visit in and of itself. Given the roulette wheel you spin every time you order at Toast, I wasn’t overly optimistic when I tried something called “The Peasant” last weekend. It is described as “two low-fat piles: egg whites scrambled with dirty rice, carrots, and corn, and black beans mixed with fresh spinach and feta.” Surprisingly, it turned out to be the best thing I have ever ordered from Toast. Note, it was not the best thing I have ever eaten at Toast- that award goes to the pumpkin pancakes with chocolate chips and sweet cream that Dave ordered. 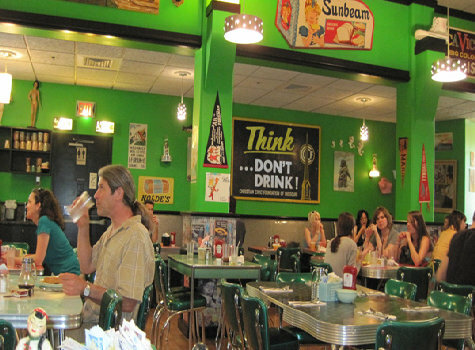 Toast is one of those places with retro diner tables and tons of crap on the walls, so if you have ADD, claustrophobia, or bad memories of your grandmother, you might want to take a pass. The wait staff is primarily hipsters with ripped tights and dyed hair. Which is fine unless they’re having a particularly emo day and leave your sweet potato fries sitting at the pick up window while they write a haiku about their pet rat. But the bartenders are reliably fantastic, and they make a mean dirty martini. If you go, enjoy. Or not.